US Plug In Electric Vehicle sales are on a tear in 2016 up +31% vs. sluggish 2015 but also up +20% vs. the record setting 2014. So what’s going on? Two words: pricing and innovation. Tesla delivered 34,455 Model S and Model X through September 30th following a very aggressive (for Tesla) sales push which included Model S and X ‘inventory vehicles’ – produced without a buyer and the ramp up of Model X production. Tesla reportedly converted a number of Model 3 buyers to Model S with its newly re-priced $66,000 base price. I visited Tesla stores in Atlanta and Cleveland where the store”cupboards” were bare and exhausted Product Specialists had delivered every vehicle they could get their hands on before September 30th. Tesla began to make deliveries of its 0-60 in 2.5 seconds P100D with its 315 mile driving range as well. Chevrolet VOLT – sales for the second generation model and its 53 mile all EV range are up +76% to 16,326 units, beating full year 2015 (15,393) and on pace to best 2014 (18,805). Used car buyer are discovering a great value in the VOLT, which sell for less than 40% of the price of its price when new, attracting the next generation of buyers to the versatile 400 mile range VOLT. BMW X5 xDrive 40E at almost 4,600 units helped push BMW “E” sales up by 24% off-setting lower sales for the i3 (2017 model gets a longer range battery pack at 110 EV miles) and i8 both off about 20%. BMW just started shipping the 330E with just 323 units delivered and the 740E arrives in the Fourth Quarter of this year. Federal Incentives (up to $7,500) are still plentiful and many states also have additional incentives on top of Federal continuing to support EV sales. US gasoline prices are creeping up but still very low so not likely impacting the sales growth of EVs. The next chapter: 2017 Chevrolet BOLT- officially rated by the US EPA at 238 miles of all electric driving range and a base price of $37,495.00 before Federal Incentives. The long-range, mass market EV may be finally here. That is until the Tesla Model 3 arrives in late 2017. Categories: #Automobiles, #ElectricVehicles, #EVSales, #EVSalesData, #Plug-In Hybrid | Tags: #BMWeDrive, #BOLT, #electricvehicle, #ModelS, #ModelX, PHEV, Tesla, VOLT | Permalink. Thanks to CleanCitiesGeorgia, and specifically to its Executive Director, Don Francis, we have our first look at EV vehicle registrations (the best measure for sales since these vehicles are actually registered for use in Georgia) in the 60 days following the repeal of the $5,000 Zero Emission Vehicle (ZEV) tax credit on June 30, 2015. No surprise, registrations have been cut in half, off by -49% to an average of 462 vehicles in July-August versus a January-June average of 915 EVs. When you look at the data broken out by Battery Electric Vehicles (ZEV tax credit eligable) and Plug-in Hybrid Electrics (ZEV/LEV tax credit ineligable) the PHEV’s are off -24% (31/month July-August vs. 41 January-June) while the BEV registrations have fallen by -46% to 431 units vs. 874 January-June. Some of this is certainly explained by the pre-Tax Credit repeal ‘Gold Rush” sales in April-June which produced sales of 3,469 EVs. And with the tax credit repealed, EV automaker sales, led by Nissan LEAF (-55%) and BMW i3 (-52%) dropped like a rock. Tesla fared slightly better experiencing only a -19% drop in monthly average sales of the 3 year old Model S (57 vs. 70 units). So is there any good news? YES! 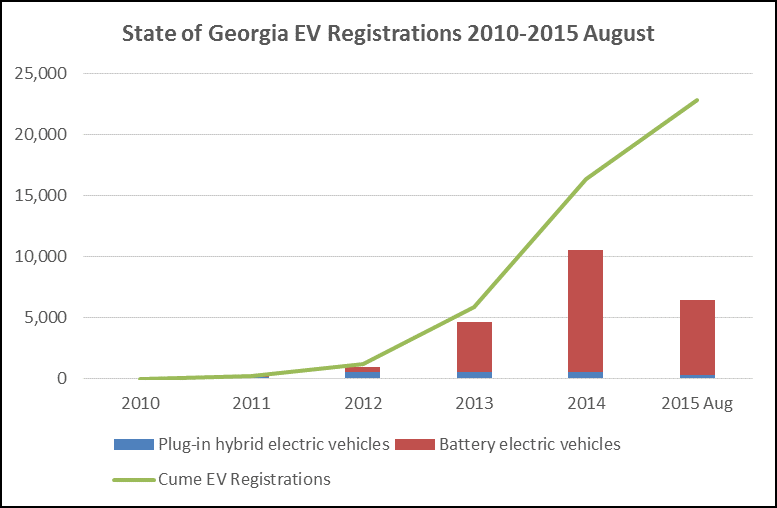 Georgia has added another 6,413 EV’s in 2015 bringing cumulative new EV registrations to 22,795 vehicles over the five year period (not accounting for trade ins, lease returns, accidents) or almost a 40% increase in the number of EV’s registered in the State of Georgia. 1). Lower cost EV’s are introduced – $30-35,000 price with ranges well in excess of 100 miles. Automotive OEM plans call for vehicles like the Chevrolet BOLT, Tesla Model III, and the next generation Nissan LEAF to meet these metrics. 2). Growing numbers of used EVs come back into Georgia. Almost daily I hear of some one who got ‘the deal of a lifetime’ on a 2 or 3 year old Nissan LEAF, Chevrolet VOLT and yes even a Tesla Model S which only adds to the EV fleet on Georgia’s roads. For 2nd owners, used EVs can be a tremendous value, with plenty of warranty left on the car and the battery and generally pretty low mileage and pricing which reflects the Federal rebates they received when new. 3). New Incentives are introduced in Georgia taking the form of a tax credit, point of sale rebate (as Connecticut, Tennessee and Massachusetts are doing) or some other form of incentive. Fortunately, the Federal Tax Credit for EV’s still has a long life ahead since it is based on the number of qualifying EVs produced by the automotive OEMs (200,000 per name plate then phasing down thereafter). 4). The EV Road Tax is reduced or repealed. The current $200.00 EV road tax as has been discussed on this blog before, is unfair and unjust. It will likely be the subject of legislative proposals in the 2nd year of this Georgia General Assembly session or into the next. As more data becomes available, look for updates to this blog post. Categories: #ElectricVehicles, #EVSalesData, #TaxCredit, #TaxIncentives | Tags: #Atlanta, #electricvehicle, #EVsales, CleanCitiesGeorgia, LEAF, Tesla | Permalink. 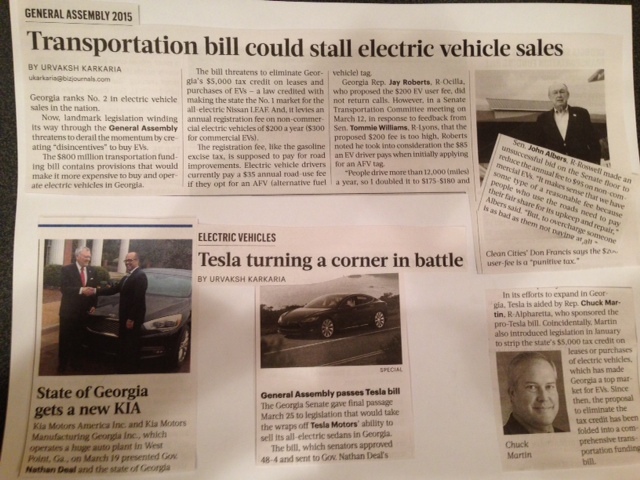 The March 27, 2015 issue of The Atlanta Business Chronicle was laden with articles covering the Electric Vehicle business in Georgia. Depending upon where you sat on the issue of EVs in Georgia, you felt good, bad or just ugly. Good: Tesla direct sale bill was approved by both houses and sent to Governor Deal for signature. This lifts the current 150 ‘custom car’ restriction from Tesla (and new owner hassle of exchanging a California Title for a Georgia one) and permits unlimited direct sales through a maximum of 5 Tesla stores in Georgia. By today’s count (Marietta , Decatur Sales/Service and Lenox Gallery) that permits at least two more sales/service stores if the Gallery is counted in the total of five. This is great news for current and future Tesla owners, who can now enjoy unimpeded access to the Model S, forthcoming Model X and planned Model III. Rep. Chuck Martin introduced this bill. Bad: All efforts to advance a compromise reduced EV tax credit, with phase out and annual budget caps has failed to find any support in the Georgia Assembly. Despite hundreds of calls, emails, signed petitions and personal visits to legislators, and manufacturer ride and drive events, Rep Ben Harbin (HB 220) and Rep Don Parsons (HB 200) provided the only support for EV or EVSE tax credits. Sadly, Parsons’ clarification bill for EV charging station tax credit eligability passed the House but could not find a quorem in the Senate on March 26th to vote on it. On the road use fee, Rep John Albers desparately tried to amend the bill to reduce the fee to $95.00 which failed. As the ABC reported, House Transportation Committee Chair Rep Jay Roberts, basically just made up the $200.00 EV road user fee – doubling the current first time AFV registration fee of $85.00 to $170.00 and rounding up to $200.00. Georgia’s national rank in math? Ugly: While the debate about the elimination of Georgia’s ZEV $5,000 tax credit is not finished, it’s fate, and that of a $200.00/year road user fee are tied to that of the state’s $1.5 Billion Transportation Bill. Governor Nathan Deal is on record favoring the House version (HB 170). A House-Senate Conference committee must produce a compromise Bill before the planned end of the 2015-16 Legislative session on Thursday April 2, 2015. Governor Deal has already put the Georgia Assembly on notice that he will call them back into session to produce a satisfactory Bill for the Governor to sign. On a final note, KIA announced that it would introduce the 2015 KIA SOUL EV into Georgia. This same week, the ABC reported, Governor Deal did accept the keys to a $69,000 2015 KIA sedan, in support of the West Point GA KIA manufacturing plant. We just wonder why Governor Deal did not get the keys to the KIA SOUL EV? Categories: #ElectricVehicles, #EVChargingStations, #EVSalesData, #GeorgiaStateLegislature, #TaxIncentives, #Tesla | Tags: #AtlantaBusinessChronicle, #EVTaxCredit, #KIA, Georgia, Tesla | Permalink. No that’s not a typo in the headline! 2014 is in the history books and by all accounts, has been a fantastic year for electric vehicles – smashing the 100,000 annual unit sales mark in November! More new EV models have launched in 2014 than in the prior 3 years combined and many new/upgraded EVs are coming in 2015 and beyond. 1). Electrified Vehicles Reach the 1% of vehicles sold nationally in 2015. EVs should easily reach this mark on a total industry sales of 16.5-17.0 million yielding 165-170,000 electrified vehicles added to US roads in 2015. Many states have added electric vehicle or charging station incentives or both. With expanded charging infrastructure and high satisfaction rates among EV owners, the rate of sales growth should propel EVs close to 1% of all vehicles sold. 2). Nissan LEAF approaches the 200,000 Federal Tax Credit phase out. What Now? Arguably, Nissan has done the best job marketing their all electric LEAF which launched in the US in 2011. By the end of 2015, cumulative LEAF sales will be close to 170,000, just 30,000 units shy of the Federal Tax Credit phase out requirements. With an all new vehicle slated to launch in the 2017 Model Year (on sale as early as January 2016), how will Nissan market the all new LEAF without its $7,500 tax credit? Stay tuned – Carlos Ghon has a plan! 3). Tesla FINALLY launches the Model X – Falcon Wing Doors and All. Look for a Merry Christmas 2015 post on the Tesla blog from Elon Musk announcing the first deliveries of the 2015 Model X – it’s still 2015 and Elon has ‘kept his promise.’ Seriously, the Model X will be another game changer in the high end 6-7 passenger SUV market and will begin to impact Tesla sales in 2016, attacting new buyers to the marque. Of course, it won’t hurt sales of the Model S, since the majority of its owners have already traded up to the Model D – satiating their need to have the latest Tesla gadget. Savvy used car buyers will snap up the discarded Model S 1.0 offerings at reasonable ($50,000 – 60,000) prices knowing that Elon has promised a battery upgrade in the future and the software upgrades continue. 4). Chevrolet VOLT 2.0: a lower cost VOLT 1.0? Let’s face it, without Bob Lutz there would not have been VOLT 1.0. And without former GM CEO Dan Akerson pushing to get $10,000 of cost out of the VOLT, there would not be a 2.0. GM is working hard to ‘tease’ us with it’s mini reveals. But look at the 2015 Chevrolet Cruze and you get an idea of what the 2016 VOLT is going to look like: compact. Range may improve modestly (45-50 electric miles) but this vehicle will not be a game changer; it’s likely the vehicle that should have launched in 2011: $29,995 base price, useable gauges, 3 person “Cruze Sized” rear seat.‘ I hope there are more substantial surprises when the VOLT 2.0 is unveiled at the NAIAS the week of January 12, 2015: like using more than 60% of the 17.1kWh battery! 5). Georgia’s ZEV Tax Credit takes center stage. With Georgia and metro Atlanta garnering a lot of headlines in 2014 as the fastest growing EV market in the US, the handling of the current ZEV/LEV tax credit (currently $5,000/$2,500 with no sunset) will become a national story. How this one ends up is anyone’s guess. But one thing’s for sure: Nissan will have the best sales month ever in December 2014 for the LEAF given the metro Atlanta dealers are selling/leasing against the fear that the $5,000 ZEV tax credit will disappear in 2015 so get your LEAF now! Let’s just hope that everyone can agree on the core issue: air quality in metro Atlanta/Georgia needs more EVs on our roads to help get annual CO2 emissions well below the 150 million metric tons emitted in Georgia! 6). “PV2EV” begins to have it’s day in the sun. Wouldn’t it just be smart to tie EV charging to its own renewable power generation? For years, separate and uncoordinated incentives (and arguably disincentives) between solar power and electric vehicle charging station infrastructure has kept these two technologies apart. 2015 might be the year when enough solar powered charging stations are built to move the needle in the direction toward a sustainable PV2EV deployment. With solar power costs falling and the cost to retrofit parking lots and garages with EV charging stations expensive, the time has come for PV2EV to have it’s day in the sun! 7). Georgia Becomes A Leader in Electric Vehicle Charging Infrastructure. Between the push by NRG into the metro Atlanta market from it’s home base in Houston TX, and the announcement by Georgia Power to construct it’s own charging islands (both firms offering DC Fast Charge and 240 V Level 2) Georgia and more specifically metro Atlanta, will become a model for the deployment of fast and convenient EV charging. By the end of 2015, metro Atlanta will have at least 50 charging islands including installations in Athens and other outlying cities. Added to that are the public charging stations funded by GEFA that will improve EV charging station availability in the Atlanta suburbs. It will be fun to see how 2015 unfolds for electric vehicles and the supporting infrastructure. We’ll come back and revisit these ‘headlines’ and see where we hit and where we missed. Your comments and your own headlines are welcome. Thanks for your readership in 2014! Categories: #cleanair, #ElectricVehicles, #EVChargingStations, #EVSalesData, #EVSE, #GeorgiaStateLegislature, #NissanLEAF, #smartgrid, #TaxIncentives, #Tesla | Tags: #Atlanta, #Carbon #Emission, #CarCharging, #electricvehicle, #taxcredit | Permalink.